In the summer of 2008, in response to heightened public concern about higher education academic quality and heightened pressure for accountability, 21 current and former college and university chief executive officers and board members considered the topic of governing boards and accreditation. Specifically, the discussion focused on the appropriate level of board engagement in the accreditation process and how it can best be achieved. Subsequently, the boards of AGB and CHEA, as well as each organization’s several advisory groups, commented on the issue, acknowledging that just as accountability for quality is central to the fiduciary responsibility of governing boards, accrediting organizations are considered by the academic community to be central to assuring the quality of a college or university. This joint advisory statement was approved by the boards of directors of AGB and CHEA, and it represents the best thinking of both organizations on the relationship of governing boards to the process of accreditation. Accreditation is a periodic, peer-based system of review of higher education institutions and programs. It is designed to assure the public of an institution’s commitment to academic quality and fiscal integrity as well as to stimulate ongoing improvement by the institution. The voluntary practice has existed for more than 100 years and typically begins with an institutional or programmatic self-study, followed by a visit from a group of experienced faculty members and administrators from other institutions who have been trained to evaluate institutional performance. This evaluation is made within the context of accreditation standards, as determined by the applicable accrediting organization. At present, 80 recognized accrediting organizations operate throughout the United States, reviewing public and private, two-year and four-year, nonprofit and for-profit institutions and a range of program areas, from law to medicine and the health professions, from social work to teacher education and engineering. Accreditation’s work is built on the core values of higher education: the importance of institutional mission as central to judgments about quality; the need for institutional independence, flexibility, and the freedom to carry out the important work of colleges and universities; accountability and the meeting of standards; fiscal integrity and the maintenance of adequate institutional resources; and the exercise of academic freedom by faculty. At its heart, accreditation is a process through which an institution holds itself accountable to the academic community and the larger public, and as such it plays a key role in the success of U.S. higher education. It is self-regulation of an institution’s or program’s governance, finances, and academic activity, including curricula and academic standards. Thus, as stewards of an institution, and in conjunction with the president, administration, faculty, students, and staff, governing boards are obligated to ensure mission achievement as part of their fundamental fiduciary responsibility. Accreditation not only functions as the primary vehicle for peer review and self-regulation of academic quality, it also has a relationship with the federal government that affects each accredited institution or program in the country. Since 1952, the federal government has required that institutions or programs seeking eligibility for federal funds be accredited by an accrediting organization that the federal government has recognized as meeting federal standards for this purpose. Federal funds include student aid grants and loans, research funds, and program funds—more than $100 billion per year in recent years. This relationship between accreditation and the federal government is often referred to as the “gatekeeping” role of accreditation. Beyond the heightened individual, societal, and economic pressures for accountability, American higher education remains collectively responsible to the broader public good. As such, governing boards can assure policy makers and the public that the unique U.S. higher education enterprise is operating with integrity and stability, is delivering high-quality academic programs, and is worthy of its autonomous authority and self-regulation by demonstrating their engagement in the accreditation process. This statement offers suggestions for effective practice to governing boards and chief executive officers as they work with accrediting organizations. The statement is advisory and is not intended to be prescriptive. It is left to presidents and governing boards to determine whether the suggested practices are of value at their individual institutions and how to make use of them in a manner that best fits the specific environment and needs of each college or university. The orientation program may include an overview of: the accreditation process and the number and types of accreditations held; how to determine if the institution’s educational programs are consistent with its mission; how academic priorities are supported by resource-allocation decisions; and how the accreditation report can aid institutional planning. Review key elements of the accreditation self-study, the visiting team’s report, and formal action and decision letters from the accrediting organization and consider their implications for the institution’s strategic goals, mission, and resources. Participate in the accreditation process. Some board members may be asked to meet with the visiting team during the accreditation process and need to be prepared to contribute in other ways. Develop, with the leadership of the chief executive officer, a plan for ongoing governing board involvement in accreditation review (for example, self-study preparation, site visits, and review of accreditation reports and decisions). This process links the board’s responsibility to monitor educational quality to the process of self-regulation and self-study, as well as to a continuous review of educational quality. Establish clear expectations of the board chair to work with the president on the accreditation process, including opportunities to meet with the visiting team and an expectation that the chair will receive the visiting team’s final report when it is submitted to the institution. Assure that faculty participation in the process is cultivated to take advantage of the faculty’s institutional knowledge and academic expertise. Become aware of the public policy role of accreditation and its relationship with federal and state government and how this affects an institution or program. For system boards, understand the accreditation processes of constituent institutions. Systems present a particularly complex and challenging environment for boards due to the number of institutions within their purview. It is incumbent on system executives to keep the system board informed of upcoming reviews, alerting the board to any perceived difficulties. Familiarize the board with the standards of accrediting organizations that apply to board governance and of actions that may be required to address them. Engage the board in a periodic review of the various accreditations held by the institution, the costs involved, the obligations incurred, and the value added to the institution and its programs, as well as the anticipated schedule for future accreditation processes. Provide the board with periodic updates on the status of all pending accreditations and institutional actions that have resulted from previous accreditation reviews. Prepare strategies, with board leadership (perhaps led by the board’s Executive Committee), for board engagement in pending accreditation processes. Inform the board about specific expectations related to governance that will be evaluated in upcoming accreditation reviews and ensure the availability of board members to communicate with the visiting team. With the chair, ensure that board agendas include relevant issues for board consideration resulting from accreditation reports. Provide leadership and participate in orientation programs for new and current board members on issues related to accreditation. Work to more fully engage faculty in accreditation, including participating in their own institution’s accreditation reviews, participating in reviews of other institutions, and serving on accrediting decision-making committees. The leadership role of the faculty and academic administration is critical to the success of the accreditation process. Board engagement in accreditation process and policy is central to the ongoing vitality and value of accreditation and its work on behalf of students, colleges and universities, government, and the public. This engagement also benefits board members by affirming and strengthening their fiduciary roles in assuring the quality, efficiency, and effectiveness of the institutions they govern. 1. 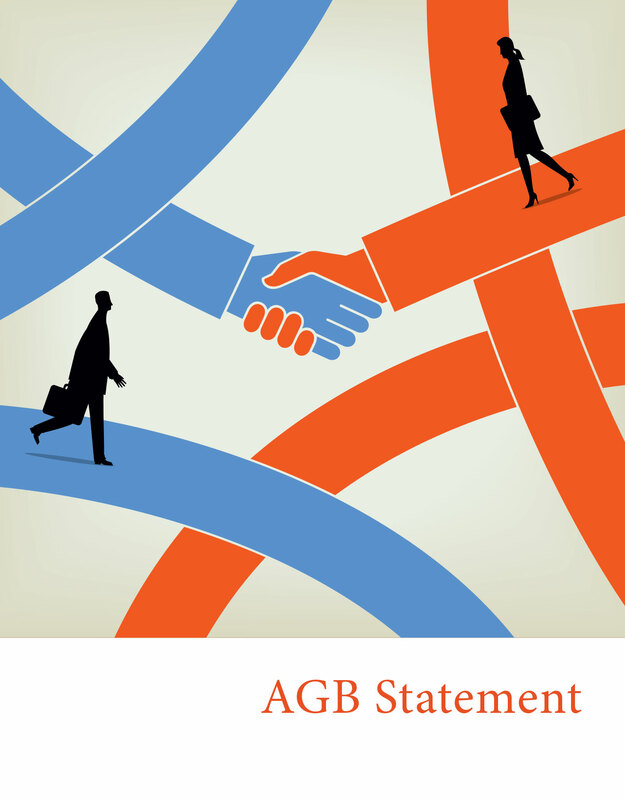 AGB Statement on Board Accountability, Adopted by the AGB Board of Directors, January 17, 2007. 2. New Leadership for Student Learning and Accountability: A Statement of Principles, Commitments to Action. AACU and CHEA, 2008. 3. Presidential Guidelines Series, CHEA December 2007. 4. The Board’s Role in Accreditation. Michael F. Middaugh. AGB, 2007.